Combine buttermilk, garlic, hot sauce, salt, pepper, paprika, and cayenne pepper in a large bowl and stir until combined. Rinse chicken and pat dry. Place chicken in 13x9-inch baking dish. Pour buttermilk mixture over chicken, cover and refrigerate 30 minutes. Heat the oven to 400° F. Place corn flake crumbs in shallow dish and season stir in salt and ground black pepper. 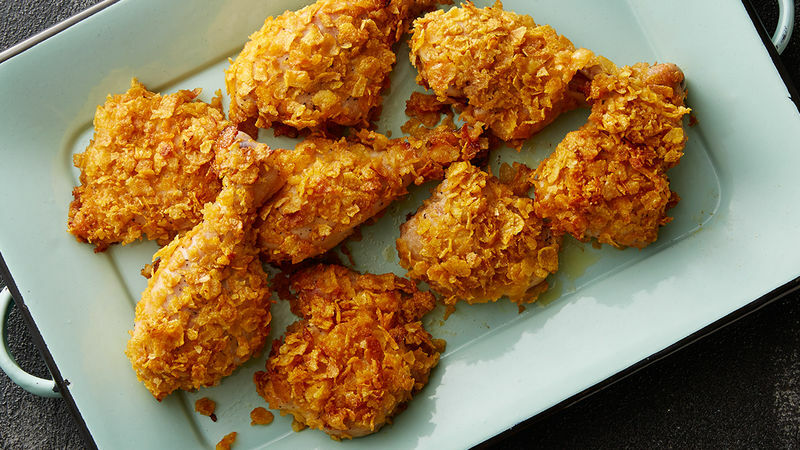 Remove chicken from buttermilk mixture and dredge in corn flake crumbs, coating completely. Place coated chicken on foil (or parchment) lined baking sheet. Drizzle melted butter over chicken pieces. Bake until crispy and golden, approximately 35 minutes.